Boring to Brilliant Book Launch Party | Boring to Brilliant! join a masterclass to learn the newest presentation tips, behind the scenes insights, and how to position your story to reach the TEDx stage. be involved in the exclusive launch of Barbara’s new Boring to Brilliant! Reference Guide for speakers 2nd edition, that will be available for sale during the book signing. Snacks and drinks are included, and you will have a chance to win a one-hour coaching session with Barbara or a signed copy of the book. 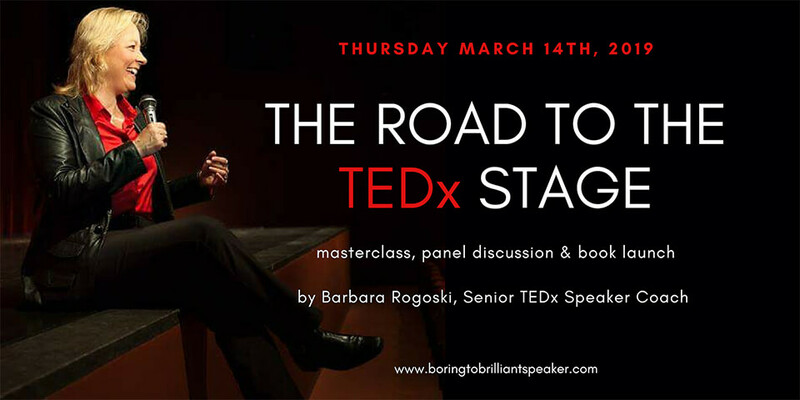 20:00 – 20:45 4 TEDx speakers panel discussion; What does it take to get there? Do’s & Don’ts? What does it bring you? Event will be managed by Eventbrite. VIP Ticket – Euro 149.00 ex VAT; Includes a full ticket (drinks and snacks) to the event, a signed book and a 30-minute speech video review or 30-minute coaching session with Barbara Rogoski. Regular Ticket – Euro 49.00 ex VAT – Includes a full ticket and a gift. Please note: when you click here, you will be taken to the Eventbrite site, where you can purchase your tickets online.